1. 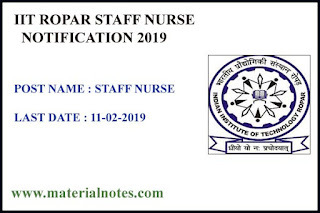 Intermediate (10+2 with Science) OR equivalent and must have passed the examination held by the Nursing Council with 3 years course in General Nursing and Mid-wifery with at least 55 % marks from recognized Board/ Institute. 2. Registered as A grade Nurse with Nursing Council. iii). At least 03 years of relevant experience in a hospital. JIPMER Staff Nurse Jobs 2019.